She’s back, and she’s udderly wonderful…the Lactaid’s “mess with you” lactose cow for the lactose-intolerant, that is! Our scene begins with a couple eating ice cream in a dimly-lit living room. From out of nowhere, we hear a martial arts cry. — Why, it’s the Lactose Cow ready to mess with the lactose-intolerant! She strikes a pose, and then there is a flurry of flailing and karate-chopping hooves as she advances dramatically to the ice cream eaters on the couch. 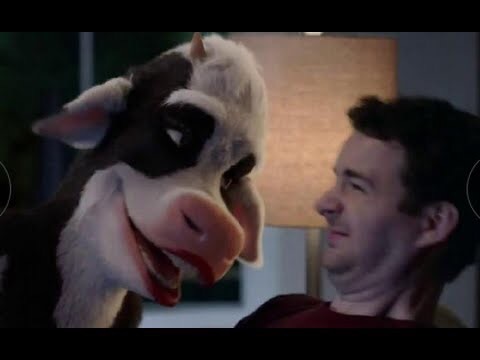 “Right…in…your…STOMACH!,” the cow announces as the guy visibly recoils. But alas, the cow is unable to resist a bit of showmanship. “Watch this!,” she declares as she launches into a vaulting maneuver, at the exact second that the Lactaid Cow opens the French doors, sending the charged up bovine tumbling outside. Once again, she was unable to mess with the lactose intolerant; pity! Now I think that this energetic cow might be the ideal running mate for Hillary Clinton. She’d bring excitement and charisma to Hillary’s campaign, and could settle Donald Trump’s hash. We’d have a furry a heartbeat away from the presidency…works for me! This entry was posted on June 8, 2016 at 7:31 pm and is filed under absurdities, animal spokepersons, anthropomorphic, furry commercials, television. You can subscribe via RSS 2.0 feed to this post's comments. Btw: I saw a couple of interesting documentaries on NatGeo Wild, the other night. About China and Japan, respectively. Interesting shots of baby Chinese alligators hatching from their eggs. Plus, some kind of mantis-like bug that fishes for larval salamanders before they grow up to be giants like their folks! One final thought for tonight: I heard this on the latest syndicated re-run of JOHNNY CARSON. And, it’s too good to _not_ publicly share.